Two Denbighshire primary schools will close in a bid to cut surplus spaces. The council's cabinet voted unanimously on Tuesday to shut Ysgol Pentrecelyn and Ysgol Llanfair Dyffryn Clwyd, both in Ruthin, in August 2017. Pupils will move to a new "dual stream" primary school, where parents can choose if pupils are educated in English or Welsh. Supporters of Welsh-language Ysgol Pentrecelyn said they would seek a judicial review over the decision. 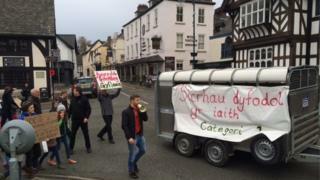 Around 50 people marched ahead of the meeting, claiming the move would not secure the Welsh language in the area. Currently, Ysgol Pentrecelyn is a category one Welsh-medium school, meaning all pupils are educated in the language. Ysgol Llanfair Dyffryn Clwyd is a category two school, meaning parents can choose what language their children are educated in - with 80% currently opting for Welsh-medium. Denbighshire council said making the new school category two would help deal with surplus places, result in financial savings and ensure more sustainable pupil numbers. It also said the move would help generate more Welsh speakers. In a separate proposal, the cabinet issued statutory notices to close Ysgol Llanbedr Dyffryn Clwyd, also in Ruthin. If the plans are accepted by councillors at a later date, it will shut its doors next August with pupils transferring to Ysgol Borthyn, Ruthin.